After an EIA report that held little exciting headlines, oil product prices either fell or held their position yesterday. 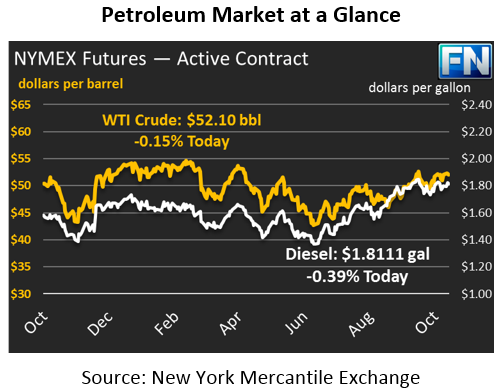 Crude prices fell 38 cents (-0.7%) yesterday, as the EIA confirmed a small crude stock build this past week. Crude is trading flat this morning, with prices last seen at $52.10. Diesel also fell yesterday, despite a sizable stock draw and rising demand. Diesel prices gave up 1.1 cents (-0.6%) yesterday, tracking crude prices lower. Higher refinery utilization, the percent of total national refining capacity in use, also likely contributed to the decrease. Diesel prices this morning are trading down slightly, at $1.8111, a loss of .71 cents (-0.4%). Gasoline alone escaped the drive lower, receiving support from EIA data showing stronger than expected demand last week. Gasoline prices ended the day 14 points higher than it opened. This morning gasoline has reversed its gains, shedding 1.7 cents (1.0%) to trade at $1.7176. The EIA data yesterday was closely aligned with API data, the second week in a row the two have been close. Since the inventory data was not news to the market, most traders dug deeper to find new meaning from the report. The general takeaway was that diesel and gasoline demand are higher than expected, though not abnormally high for this time of year. Gasoline in particular outperformed expectations, showing 9.3 million barrel per day (MMbpd) demand compared to expected demand below 9 MMbpd. Crude oil production in the U.S. rose back to 9.5 MMbpd, up 1.1 MMbpd from last week’s numbers which had been suppressed by Hurricane Nate. Exports are above 1.9 MMbpd, near record highs and just shy of the 2 MMbpd level that many have said could be achieved this year. The spread between U.S. WTI crude and international Brent crude remains high, over $6 today, which is encouraging exports as producers capitalize on higher prices in other markets. Today’s second article discusses the importance of Brent-WTI spreads on U.S. refinery production.